First, I completely forgot to let you know that the winner of The Gluten Free Almond Flour Cookbook giveaway was Tara of California. I mailed the book out to Tara’s Almond Ave. address (how fitting is that?) yesterday…thanks to everyone who entered, and many thanks of course to the lovely Elana Amsterdam of Elana’s Pantry for providing a signed copy of the book! I don’t have anything in the works yet, but I promise to do another giveaway soon! Second, I’ve changed my website and blog header once again, as well as the overall design of the blog. Sorry if I am confusing/bothering people by doing this…I’m happy with the way things are looking right now, so I’m hoping not to make any major changes again! strong>Third, I am hosting Weekend Herb Blogging this week. I’ve never hosted anything before, so I’m excited! You can find the information/rules about weekend herb blogging at Haalo’s blog. I look forward to your submissions! 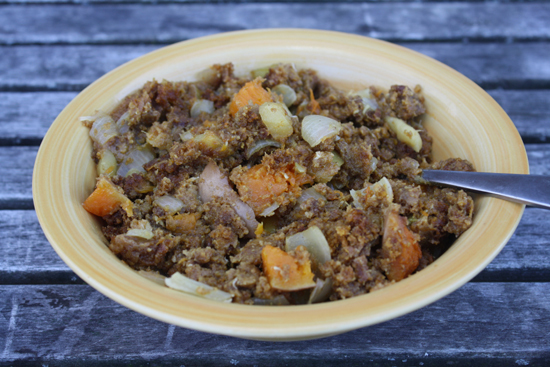 This vegetarian stuffing was inspired by Nigella Lawson’s recipe for Gingerbread Stuffing. It appears in her book Feast. I liked the idea of a sweet-ish stuffing, so I came up with my own version. I used my own pumpkin gingerbread muffin recipe as the base (make a double batch if you’d like to have some of the muffins to snack on, too)- it’s easy to make a few days ahead, crumble up, and allow to stale a bit before you proceed with the stuffing. If you don’t want to make your own gingerbread, use a good quality store-bought loaf. Mix together flour through ginger in a large bowl. In an electric mixer, beat the butter and the brown sugar until fluffy. Add the egg and mix well. 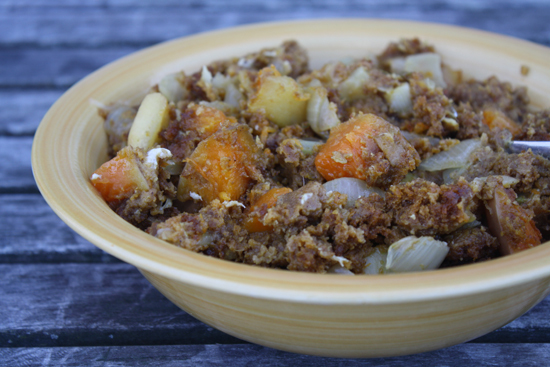 Add the pumpkin and the applesauce and mix well again. Add to the dry ingredients and mix just until blended. Spoon into muffin tins that have been greased with butter. Bake for 20-25 minutes, until a toothpick inserted into the center of one of the muffins comes out clean. To use the muffins in the stuffing, tear them into pieces and keep on a cookie sheet, uncovered, for a day or two. This should dry them out sufficiently; alternatively, you could put them in a 350°F oven to for 10 minutes or so before proceeding with the stuffing. Melt the butter in a large cast iron skillet over medium heat. Add the onion and apple and cook for 2-3 minutes, until fragrant and soft. 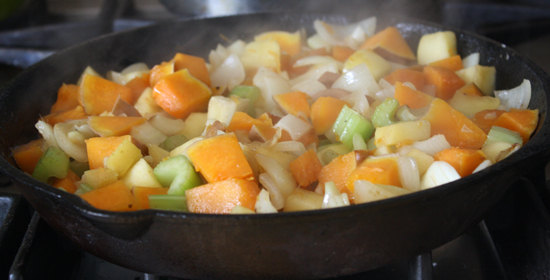 Add the cubed pumpkin, celery, and fennel and cook for 3 more minutes. Add the apple cider and the ginger and cook for 7-10 minutes, until most of the cider has cooked off, and the vegetables are cooked through. Remove from the heat and mix in the salt. 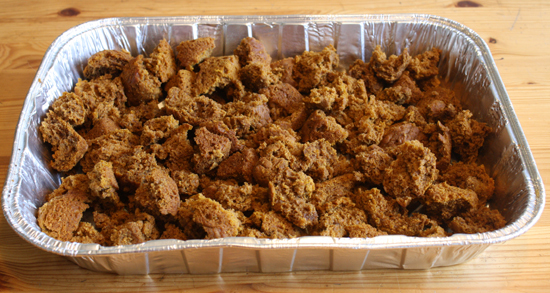 Mix the wet ingredients with the cubed pumpkin gingerbread in a large bowl. Add the eggs and the stock and mix well. Bake uncovered in a 350 °F oven for 50-60 minutes until the bread has crisped on the top. Serve warm. As you may or may not have noticed, I’ve been posting lots of Thanksgiving-esque dishes lately. I’ll post a Thanksgiving recipe roundup next week! Thats such a great idea for stuffing – dried out muffins! Although we’ve already had Thanksgiving, I’ll keep that in mind. Congrats to Tara! Wow, this sounds so wonderful and tasty!